Our surveyor, Wayne, visited a property this week suffering with dry rot infestation caused by poor service both from an installation and survey carried out following concerns of damage caused by poor subfloor ventilation. It was found by our surveyor that new air bricks have been installed by another company but have NOT been put all the way through the walls, only through the first bit of the external brick therefore not allowing proper ventilation. Not only did our customer suffer as a result of the poorly fitted air bricks, they were visited by a surveyor from another company after suspecting a damp issue, who failed to make a thorough inspection on the extent of the damage of the customers floor. 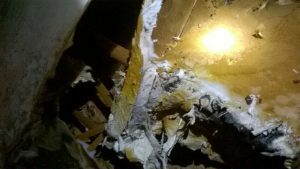 Instead of inspecting under the floor to examine the root of the problem, the carpet was merely pulled back which in turn resulted in a false report on the cause and extent of the issue. After the customer contacted Damp Solutions (Preservation) , our surveyor visited the property to carry out a full inspection and confirmed the damage was due to a problem with the subfloor ventilation due to the poorly fitted airbricks resulting in this decay of timber and dangerous dry rot infestation! 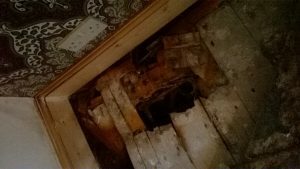 What is Dry Rot an how is it caused? Dry Rot is a wood destroying fungus that digests parts of the wood which give the timber strength and stiffness therefore when it begins it can have serious structural effects and cause horrendous damage. Dry Rot is a type of fungus that eats away at the cellulose component within wood turning it brown and ultimately reducing the timber to a dry and crumbly state. Dry Rot needs DAMP CONDITIONS to become active! Damp and poor ventilation are ideal conditions for the fungus to attack. Dry rot spores are always present in the atmosphere. Once they land on timber, they will germinate and produce hyphae (fine strands of fungal growth), if in the correct environmental conditions. Dry Rot will eventually produce a ‘fruiting body’ which takes the shape of pancake with an orange surface. A large numbers of spores are generated from the centre of the fruiting body and form the red “dust” often visible where there is a significant attack of dry rot. Wood shrinks, darkens and cracks. A silky grey mushroom coloured skin frequently tinged with patches of lilac and yellow. White, fluffy ‘cottonwool’ mycelium develops. Fruiting bodies – soft, fleshy pancake with an orange surface. Removing the source of moisture should be the first action when removing Dry Rot. Whatever the source of the dampness, if it is rectified and the timber allowed to properly dry out, the dry rot will eventually be controlled. If you suspect Dry Rot, Damp Solutions (Preservations) have a team of professionals with years of experience in all damp related problems. We carry out a FREE DAMP SURVEY (subject to terms and conditions) with a thorough inspection and explanation of the problem and our solution!